EDIT: The delay until Wednesday is a combination of my having issues with my back over the weekend, and my not being satisfied with the scripts for upcoming comics. Granted, it's possible I would've sorted out the scripts by now if I wasn't sleep deprived by the back pain keeping me up, but only some alternate universe version of me that didn't have back pain this weekend knows that for sure. Fair warning, I'm the jerk who wrote those dang scenes with Pandora, and even I got a bit teary eyed looking back at them. Wait, should the fact that I wrote it make me more or less vulnerable to feels? WHATEVER! Fairly warned be ye, says I.
I was considering leaving it more up in the air when exactly Pandora gave Sam his magic mark, but then I realized just how telling the placement of Sam's magic mark was, and that Grace would realize that. 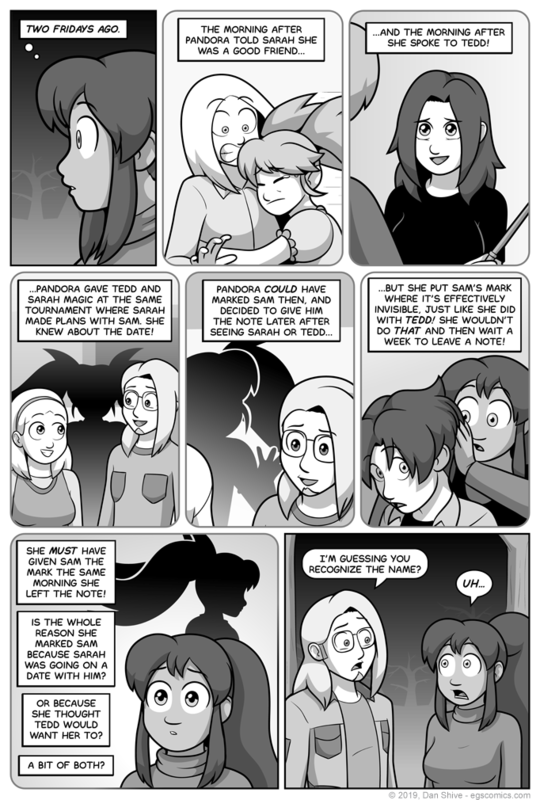 Granted, Grace has less information than we do, and she's making a bit of a conclusion jump in panel six given her more limited knowledge of where Pandora has placed magic marks on other people. That doesn't make her wrong, but still.